Winter Fairy Tale - women jewelryThere is 1 product. Cold winter days can be magically beautiful, especially on days when you go for a walk and feel sparkling snow crisping below your feet. Women, even when wearing long sleeves, trousers or dresses, can look even more beautiful, timeless and elegant with beautiful, ooak handmade jewelry. 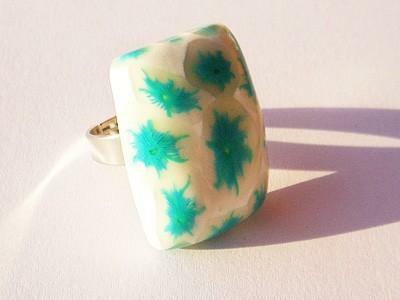 This handmade jewelry includes snowflake pendants, snowlake rings, snowflake earrings and necklaces in blue, turquoise, white, red and green colour, where each snowflake pattern is handmade and imprinted into the surface of a jewelry piece. Winter Fairy Tale jewelry is made by Nina Kolar, an artist from Slovenia. Unique, ooak red handmade dangling snowflake earrings in sparkly red and white are lovely and unique looking earrings. The snowflake pattern in white is unique and handmade. The red snowflake earrings represent a lovely present for women. IMPORTANT! Before purchasing these earrings you need to register/logg in to Unikatnica (above right Log in).